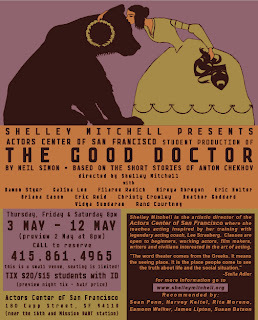 The play we've been working on at ACSF since the beginning of the year opens tonight. We had a dress rehearsal run through last night, open to the public. Most of the audience were friends of mine who came as part of Kevin's 26th birthday celebration. I was happy to have them there. What I didn't expect was that they'd be a very quiet crowd. They insisted they enjoyed the show, were very impressed, etc., but I think they were too intimidated by the unusual surroundings (small theater, amateur acting?) to express their reactions audibly. They were excessively polite, to the point that the cast was bewildered by their silence. We all figure the people who pay full price for the main show will probably be a little more savvy about audience response. Anyway, I'm thrilled to be at a point where this whole process is almost through. It's a bit of a rush for me to have started this blog thing while the play is going on, because I literally have no spare time for this nonsense. But just to keep some creative endeavors in evidence, here's a snapshot, above left, of the flyer I laid out for the show. With minor changes, we arranged it in a two sided 4x6 postcard and printed up a few to pass out. I'm a little curious about copyright concerning this. I didn't draw the image of the woman and the bear. It's from a poster for a magazine (I think) called Berliner Secession, from April 1907. The artist is anonymous, and the magazine, I would guess, is defunct (I haven't researched), but I found the image in a book of graphic design from that era. So, by copying the image from that book, am I violating their publisher's copyright? Also, the woman was originally holding a palate with paintbrushes. I erased that, and did a Google image search for "theater masks", which yielded a black and white jpeg of masks similar to those you see her holding here. I cleaned them up a little, altered some details, much like I did for the lady and the bear; but beyond that, they're just ripped off the web and pasted. Oh, and then I went back looking for the source, but a new Google image search didn't turn up these particular masks. I'm not making any money on this (the flyer, or the play), and it was a useful learning tool for Photoshop, which I'm only recently becoming familiar with. Oh, and I picked the image because -- besides looking good -- it featured a woman and a bear. Shelley inserted a scene into the play, that in itself is a smaller one-act play, by Chekhov himself, called, alternatively, The Bear, or The Boor (which brings up it's own copyright issues -- she paid for the rights to perform The Good Doctor, but we've cut a number of scenes and added this one, without expressed written consent. What's it matter?). Shelley liked the idea of using the bear for the flyer. Unfortunately, in the program, and in the lines of the scene, for this production, the character is referred to only as the Boor. So, there's really no connection. Incidentally, what's a boor? How is it different from a bore, or a boar, as those are used to describe certain people? Is there any connection to the Boers? Were they boorish, or boarish, or boring?